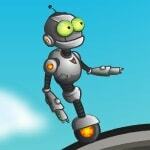 Help all robots in Go Robots 2 to reach other party of a platform. Use all sharpness to clear away a way from obstacles. With each new level will solve this puzzle even more difficult.